Less Than Reality: Are You Ready To Embrace The Upcoming Summer? - Fashion...I'm all about creating a style all my own, which typically includes a unique yet sensible style for everyday wear. It also incorporates glasses. 99% of the time, I wear glasses. I have multiple pairs, both regular and sunglasses, all set to make a statement. Thin rimmed glasses? Not for me. I want my glasses to tell people who I am. - Great deals. I love to find great deals on things, whether it's via couponing (which I love), online sale sites, discount retailers or anything else. - Blogging...in general! While I'm mostly into reality TV blogging, there are other topics that need to be addressed, and because this is my blog, I'm going to do it. In this article, we'll address all three of the loves I list above. I'm here to tell you about Firmoo.com, the world's most popular online eyeglass store. Firmoo has tons of glasses choices at awesome prices, and they embrace their fans and bloggers. Firmoo loves their bloggers so much that the company is inviting bloggers to review their products for free. If you're a blogger and want to score a free pair of glasses, visit this site: http://www.firmoo.com/free-eyewear-trial.html and apply! Anyway, I'm on the hunt for some awesome summer sunglasses. And because of this, I turned to Firmoo.com. While I did that, I came across some great fashion (and summer safety) tips. Are you ready to say goodbye to the cold of winter and embrace the sunny days of summer? We all know sunglasses have conventionally been the ideal tool to prevent UV radiation and annoying glare in the sunny season, but they're so much more than that. They're a fashion trend. And we think wraparound sunglasses for their better protection from UV rays might take the crown as as the favorable sunglass style this summer (http://www.firmoo.com/wrap-around-rx-sunglasses.html). Wear glasses full time? No worries. Get the prescription version of whatever you choose and rock your sunglasses all day long (http://www.firmoo.com/prescription-sunglasses.html). Don't know where to get affordable, awesome sunglasses? Let me solve that for you. 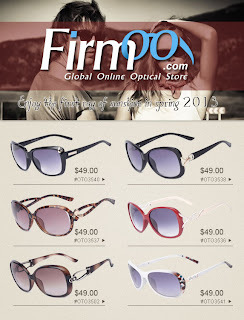 Firmoo (www.firmoo.com) should be one of your better choices, because they are offering sunglasses with high quality but at wholesale price. They've got the latest styles, designs and trends all ready to go. Check out some of their choices in the surrounding images - you'll see all the great stuff they have to offer. PS: All the photos above are from Firmoo+ (http://plus.firmoo.com/), the World’s Number 1 Eyewear Styling Community which focuses on the styling of eyewear and clothes, accessories, etc.